Style, class and elegance are evident as you tour this distinct quality constructed nv home on a premium secluded lot located in the prestigious warner meadow community. Enter into a spectacular 2-story reception hall with grand dual staircases, gleaming new moroccon cherry h/w floors and open side by side formal living and dining room arrangement. The highlight is the expansive gourmet kitchen designed with 42' timberlake cabinets, granite countertop, island, new top-grade stainless steel appliances, butler kitchen and intricate iridescent glass tile back splash. The morning sun room is adjacent to the kitchen as is a 2-story family room with custom built-in mahogany cabinetry, gas fire place and a wall of palladium windows overseeing a private wooded backyard and its newer constructed wrap around designer trex deck and lower level paver patio. A powder room and light-drenched office/study with bay windows complete the 1st floor with 10 ft. Ceilings throughout. Upstairs admire taste and sophistication in the gorgeous master bedroom suite with sitting area and well appointed private spa retreat roman master bath. The oval center tub compliments the lavish oversized frameless dual shower and his/her vanity with entrance to a dressing room with custom built-ins. Each of the three additional bedrooms has its own bathroom with cherry cabinets and granite tops. Exquisite architectural details and molding on walls, ceilings, columns, windows and doors are found throughout this incredible structure. The walk-out basement provides approx. 1,800 sq. Ft. Finished space, featuring a huge recreational area with custom full bar, billiard, media and 5th bedroom with full 5th bathroom. The 6th bonus room with walk-in closet close by can be utilized as another bedroom, exercise room or office space converting the basement given into an ultimate in-law-suite. French doors will let you exit to an extraordinary patio constructed in 2014 as well as the deck with first quality textured surfaces and custom outdoor kitchen & gas grill with half moon shaped granite counter top/bar. A large fully enclosed and waterproofed storage area under the deck provides a unique and dramatic finish to this outdoor oasis making it pleasing and practical to every entertainers delight. A newly designed front entrance with water fountain and professional landscaping are executed to a masterful outdoor space. Close to major arteries and crn sd. This fantastic home will meet your every expectation! The residence whether your family is seeking a personal oasis or hoping to create a business on a turn-key farm, this 15. 2acre property is worthy of consideration. Located within lower bucks county, in the sought after community of newtown, this gracious property is only minutes from major highways and transportation systems to philadelphia, new york city and the jersey shore. And, children will enjoy the benefits of attending the top-rated council rock schools. The stone front farm house exudes casual sophistication and comfort. You will enjoy daily living as well as entertaining and holiday gatherings in the family room that opens to the kitchen and breakfast nook. Additionally, the first floor has a living room that allows guests and children separate entertainment space, two stunning fireplaces that grace each end of the first floor, and a separate half-bath. The second floor features four bedrooms with large closets, two full bathrooms and a conveniently located laundry room. Beautiful hardwood floors run throughout the first and second floors and a generac generator provides peace of mind during inclement weather. The home is surrounded by a large fenced yard with attractive ornamental trees and shrubs that create a wall of privacy. The sounds of water falling from a large koi pond, a 20 x 40 inground, heated swimming pool, and space for vegetable and flower gardens make the backyard a perfect spot for relaxing and entertaining. There is ample parking in the detached three car garage. The equine facility the turn-key farm has supported a thriving equestrian business. The bright, sunlit barn and surroundings include 28 stalls, 9 large pastures with turnout sheds, 6 stone covered paddocks with turnout sheds, a large 90 x 180 indoor arena with observation room and office, and an expansive 100 x 260 outdoor arena with night lighting. Barn amenities include three tack rooms, laundry and half bathroom, feed room,2 hot/cold wash stalls, large hayloft and plenty of storage areas. This unique setting and buildings could easily be converted to support goats, sheep, doggy daycare/ boarding or even a tree farm. Opportunities are endless. On a personal note raising horses is both a business and passion for me and seeing the birth of my horses; lola, abbey, spice and jozie, right here in our own birthing annex and "baby" paddock has been a truly amazing experience. Just as seeing the love of a child with her favorite pony, a bond and memory that lasts forever. This farm has been personally rewarding. Over the last three years, i have rented the barn, indoor and pastures to on outside trainers, as they build their equestrian business. As a rental property, the business has generated sufficient income to substantially offset a large portion of the mortgage and operational expenses. Stunning custom brick colonial home on 6+ acres. Long majestic driveway leads you onto this gorgeous open property & to the front door surrounded by a circular driveway & many landscape features. Filled with beautiful natural light and gorgeous surroundings, this home has 4 bedrms, 3 full & 2 half baths plus an attached in-law / au-pair suite w its own entry. Elegant 2 story foyer entry leads inside to a extremely family & entertaining friendly spacious & open floor plan. Main level includes an impressive office/den, huge living room w double sided fireplace connecting to the dining room, well appointed kitchen and breakfast room w vaulted and 2 story ceilings, a relaxing & ideally located sun room w hot tub and two patios on either side, sunken family rm w stone fireplace, & the in-law suite. 2nd flr includes an opulent master suite featuring fireplace, 3 walk in closets & a master bath w all the amenities, 3 additional spacious bedrooms, & 2nd flr laundry. Downstairs is fully finished basement with so much great space for all your hobbies/needs plus a 2nd kitchen. 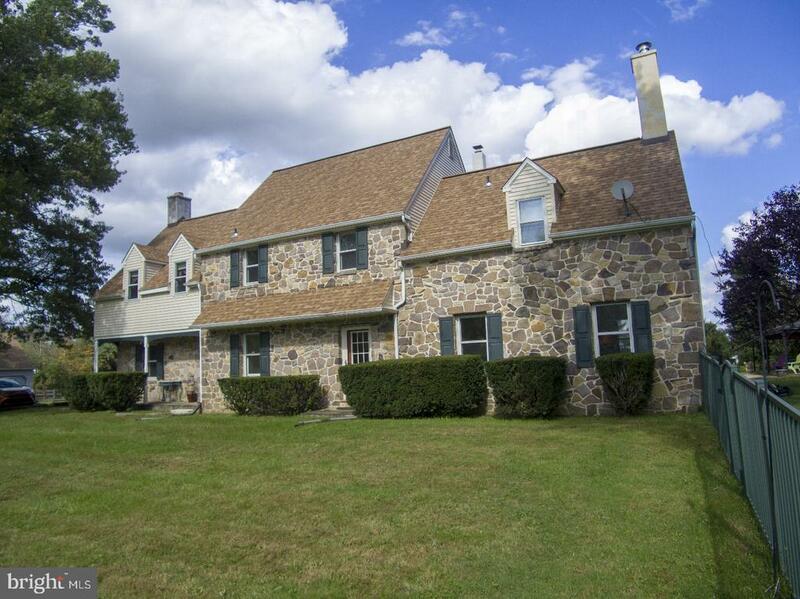 Absolutely beautiful home offering privacy yet convenience in newtown bucks county! This extraordinary home sits proudly on one of the largest lots in chapman's corner, backing to preserved open space. The dramatic entry foyer features marble floors and butterfly staircase leading to the formal living & gracious dining rooms designed to entertain on any scale. The open floorplan leads to a spacious conservatory, gathering room with fireplace and an impressive study with a wall of custom built in bookcases. Sure to be a chef's dream is this gourmet kitchen with large center island, granite counters, custom cabinetry and viking appliances. One of the highlights of this home is the adjacent morning room with panoramic views of preserved green space making it the perfect spot to curl up with a cup of coffee and unwind. Heading upstairs by either staircase are 5 bedrooms, including an au pair or in-law suite, each with its own en suite bath. The upper level also includes a large flex room. The master suite boasts a sitting area, coffered ceilings and dual closets. A sumptuous master bath features a jacuzzi soaking tub, ultra shower and a workout room. Additional amenities include a whole house audio system, lawn sprinkler system, and 4-zone hvac system, along with a full walk out basement. 2. 27 acres & in the council rock school district. Come see this exceptional home and all of the upgrades that created a luxurious lifestyle at 104 jane chapman drive. If you are seeking a home close to all the action and liveliness but still value your privacy, then hidden acres is the home for you! Sitting on approx 7 acres of beautiful land including a 2-stall horse barn, pond, creek access and stunning views is this incredibly versatile 6 bedroom home. You are greeted by an open concept foyer allowing you to view into every living space on the first floor. The study is quite spacious with french doors and floor-to-ceiling custom built in mahogany shelves and a wide open 5-panel window. The formal living room carries the beautiful hardwood floors throughout the first floor including access to the main suite. The formal dining room features a large crystal chandelier, french doors leading out to the magnificent maintenance free deck, and a butler's pantry with granite counter tops and wine rack. The gathering room contains a stone mantle wood fireplace, exposed wood arched ceiling, and a bay window. The gourmet kitchen features black galaxy granite countertops, double ovens, and a large island with additional storage space and sink. Beyond the kitchen is a breakfast nook with five 4' by 4' glass panels providing a panoramic view of the beautiful property. The first floor master suite has overhead lighting, sliding glass doors to the deck and private master bath with separate jacuzzi tub and shower with a granite countertop double vanity. 2 additional bedrooms are on the main level of the home with a hall bath. The second level includes an additional office space, full bath with double vanity and tiled floors and two more perfectly sized bedrooms. At the end of the hall there is another spacious bedroom that offers the option to be another master suite with 2 extra rooms perfect for an elaborate walk-in closet and sitting room and a full bath or a shared upstairs living area. The finished lower level contains a full bar, half bath, wood fireplace and sliding doors to the lower patio with deck access. The nearly 3,000 sq. Ft. Maintenance free deck features tons of entertaining space, including another full size wet bar and outdoor kitchen, and stunning views from all angles. Relax in the hot tub overlooking the pond or meander over the bridge to your own private island! There are large fenced in pastures, access to miles of open space horse trails, a detached 2-car garage and an outbuilding for additional storage or car enthusiast. Only a few minutes from downtown newtown with all the privacy you need. Don't wait! 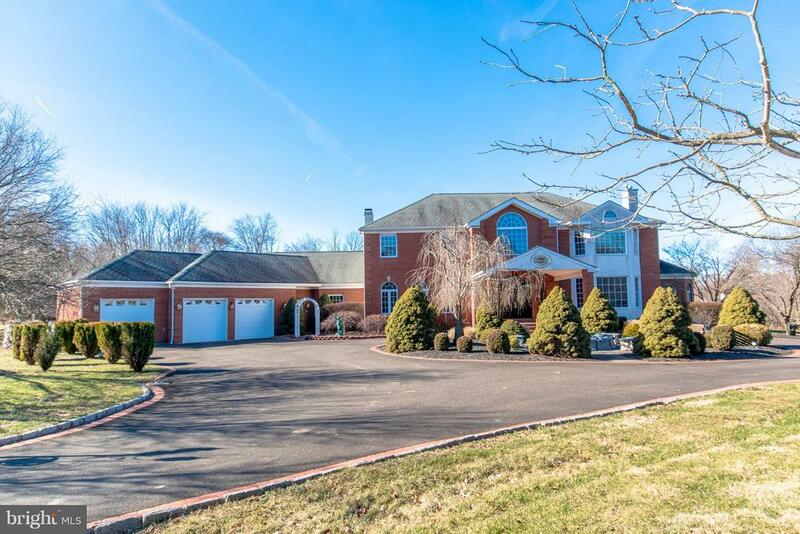 Pristine executive home in the heart of upper makefield township, bucks county. This home was the last to be built by david schrenk, one of the most respected custom builders in bucks county for many years. Starting at the walpole entry gate, the winding driveway with belgian block edging draws you toward this beautiful brick front colonial style home with beaded cedar clapboard siding at all other elevations. The careful planting of specific trees and shrubs support a continuous bloom from early spring through summer. Behind the home, a terraced patio with pennsylvania slate is a quiet and relaxing place to entertain. Elsewhere on this large level lot you find a full size bocce court and many other areas for most any kind of outdoor fun. Through the formal entrance step into the 2 story center hall topped by tray ceiling and applied molding. From the formal dining room through the butler pantry is the gourmet kitchen. Natural cherry cabinets and soapstone tops surround the butcher block island making this a chef's dream for space and organization. The family room, with brick faced wood burning fireplace and hardwood floor, will be your favorite place to read or relax in the evenings. On the other side of the kitchen, through the corridor, there is a room with floor to ceiling cherry wood paneled walls and built in bookcases making it a proper library. Perfect for your home office. Before the library you'll find a powder room across from the laundry room with full shower, the combination these spaces could be a guest or in-law suite if you'll just close the pocket door at the kitchen before the corridor. Also on the main level are a formal living room and conservatory. Finished lower level with wet bar, pool table and entertainment area. Also on this level are a full bathroom and potential 5th bedroom, providing you with several options. 15 lite double french doors give you access to the patio via the wide light filled stairwell. On the upper level: master suite with tray ceiling, generous bath and walk in closet fill the entire west side. A 2nd bedroom with bath en-suite is followed by 2 more bedrooms that share the hall bath. Top quality construction features employed throughout. The solar panel array and net metering saves more than half of all electricity costs. Some additional features include: pella and andersen windows, california closets, two water heaters, 400 amp service, new hvac systems, water treatment system, heat lamps in all bathrooms, multiple trimmed tray ceilings, carriage style garage doors, basement theater & sound system. Just over the river is the trenton train station for access to amtrak and its acela express, also new jersey transit regional lines. Close to all major highways for easy commute to new york city and philadelphia. 30 minutes to princeton. 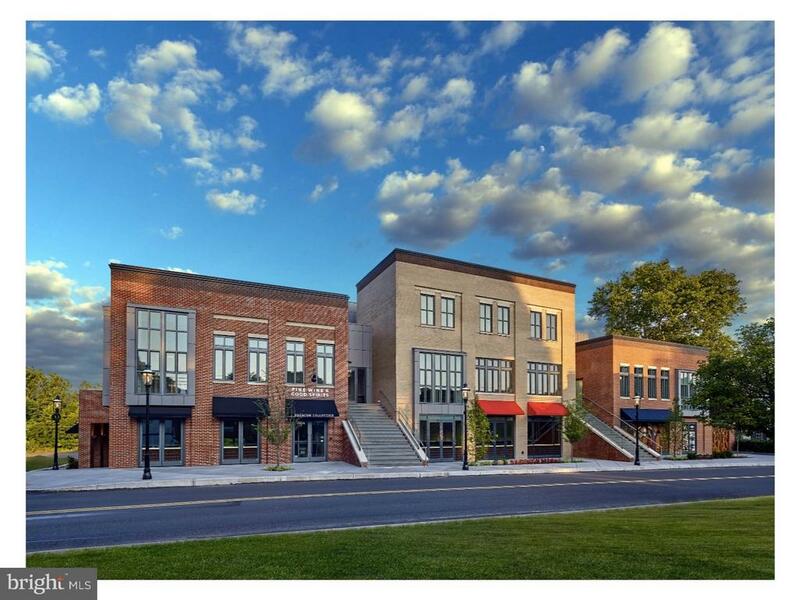 Dine and shop in new hope, peddler's village, doylestown and newtown boro, all just minutes away. As of today, 4/21/2019 the average home price for homes for sale in Newtown is $872,376.